Our history began on August 29, 1892, when a few members of the Franklin Union Baptist Church thought that the time had come to separate from that church. On September 3, 1892, the proposition was accepted for a division from Franklin Union and for a new Baptist church to be organized. This group met in the vestibule of the Franklin Union Baptist Church to appoint a clerk for the newly organized Baptist church. A motion was made to meet in the Grange Hall in Walkchalk on October 13, 1892, which they subsequently did. On that date a resolution was presented forming the new church to be known as Salem Baptist Church. 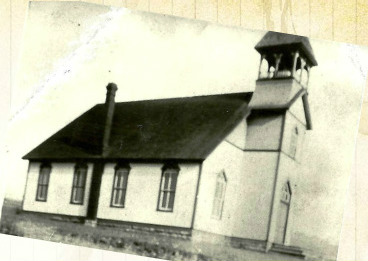 At the April 22, 1893 business meeting, the decision was made to build a church. A half-acre plot directly across the road from the Grange Hall was purchased for $125.00. On November 10, 1894, the church treasurer reported that the cost for building the church was $1,019.35. 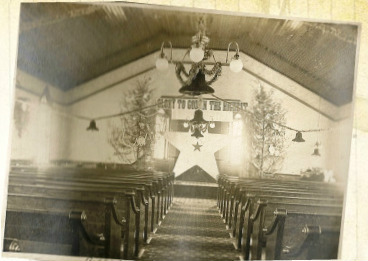 The church building was dedicated on October 27, 1895. Our church is still using the original pulpit and the original bell that is in the belfry. Our church also has the original Communion set which consists of a tankard and two chalices which are displayed in the case in the narthex, along with the original "Minutes Book" and "Roll Book". The exterior photo was taken in 1910 and the interior photo is from 1909.